i adore Creative Design, both in graphic or web design, i do coding sometimes too, always love vintage style, & prefer blind contests, Feel free to invite me to your contest and 1-to-1 projects. "Thanks for putting heart and into this work!" 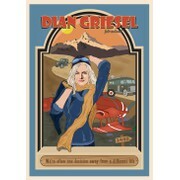 "From the get-go, this wonderful designer captured the spirit of my life-changing plane crash. This designer was receptive to my feedback and made changes in a timely fashion. I am very happy with the final result." "VisioN3RD brought a lot of creativity and style to the submissions, while staying on point with the overall design brief. Many different variations were presented that showcased aspects of the website that we had not originally thought of. We would hi..."
"I am very pleased with the results of working with VisioN3RD. I have a classy website design that reflects my business culture, my taste, and image I wish to project to my customers. VisionN3RD was agressive in implementing requested design changes and..."